Died: 6 March 1447, Ghent Canonized: 24 May 1807(Diminutive of NICOLETTA, COLETTA). Founder of Colettine Poor Clares (Clarisses), born 13 January 1381, at Corbie in Picardy, France; died at Ghent, 6 March, 1447. Her father, Robert Boellet, was the carpenter of the famous Benedictine Abbey of Corbie; her mother's name was Marguerite Moyon. 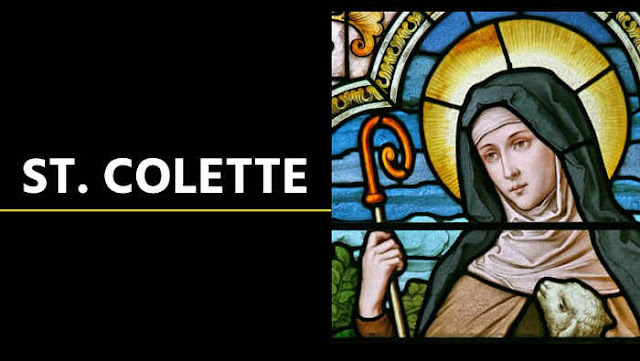 Colette joined successively the Bequines, the Benedictines, and the Urbanist Poor Clares. Later she lived for a while as a recluse. Having resolved to reform the Poor Clares, she turned to the antipope, Benedict XIII (Pedro de Luna), then recognized by France as the rightful pope. Benedict allowed her to enter to the order of Poor Clares and empowered her by several Bulls, dated 1406, 1407, 1408, and 1412 to found new convents and complete the reform of the order. With the approval of the Countess of Geneva and the Franciscan Henri de la Beaume, her confessor and spiritual guide, Colette began her work at Beaume, in the Diocese of Geneva. She remained there but a short time and soon opened at Besançon her first convent in an almost abandoned house of Urbanist Poor Clares. Thence her reform spread to Auxonne (1410), to Poligny, to Ghent (1412), to Heidelberg (1444), to Amiens, etc. To the seventeen convents founded during her lifetime must be added another begun by her at Pont-à-Mousson in Lorraine. She also inaugurated a reform among the Franciscan friars (the Coletani), not to be confounded with the Observants. These Coletani remained obedient to the authority of the provincial of the Franciscan convents, and never attained much importance even in France. In 1448 they had only thirteen convents, and together with other small branches of the Franciscan Order were suppressed in 1517 by Leo X. In addition to the strict rules of the Poor Clares, the Colettines follow their special constitutions sanctioned in 1434 by the General of the Franciscans, William of Casale, approved in 1448 by Nicholas V, in 1458 by Pius II, and in 1482 by Sixtus IV.